Film shows British concern over WW II cluster threat to civilians. U.S. knockoff of German bomb is still found in Laos today. 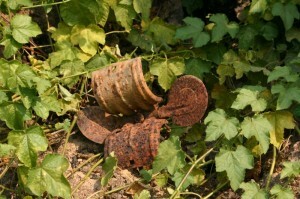 During Project Phongsali we found numerous cluster bomblets designated the “M-83” in and around Sop Houn Village. This device has three fuses: an impact fuse, a mechanical timing fuse, and an anti-handling fuse. Containing over 200 grams of high explosive, they pack greater destructive power than most other, more frequently encountered, cluster munitions. The M-83 was American manufactured but not an American invention; it was a nearly complete “knock-off” of the infamous “Butterfly Bomb” that Germany dropped on England during World War II. As such, it represents of one of the earliest models of cluster munitions. This American cluster bomb, the M-83, was modeled after the "Butterfly Bombs" that Germany dropped on England during World War II.